Not long after LOST premiered in September 2004 I became a huge fan of Terry O'Quinn's. So much so that I joined the website www.TheFuselage.com and have even interacted with Terry there to the point he's become rather familiar with me. So, when I learned on Friday, Februray 15, 2008, he was going to be on The View the following Tuesday, I purchased my bus ticket and made the trip from New Hampshire to New York City. I had to leave NH around 11:30pm the night before, becuause I was catching the bus out of Boston. Although my bus didn't leave until 2:30am the following morning and we live only 45 minutes from Boston, my husband had to drop me off early so he could get back home and get a decent night's rest. Thank goodness for supportive husbands! At 2:30am on Tuesday, Feb 19, 2008 my bus pulled out for our 4 hour trip into the Big Apple. The bus trip was uneventful and we even arrived 15 minutes early. Once in the city, I caught the subway and headed directly to the ABC studios where The View is filmed. I had no problem finding the building. Considering I had no idea how things were laid out, I went inside the front door and spoke with one of the security guards at the front desk. I explained I had come in from NH and was with TerryO'Quinn.org and hoped to see Terry. The guy was nice enough, but told me the guests' limos just drive in and then leave, when they are done. However, he did tell me where to go. I certainly was not deterred and headed in that direction. On my way there, I saw three people waiting outside the front of the building. They were from Boston, but had come on an earlier bus, and were trying to get standby ticket and decided I'll have to try that sometime. I then walked around the corner and located the security booth in front of the parking lot and told that guard the same story. He said sometimes the guests do get out and talk to their fans, but not all the time. He also informed me that the guests usually arrive between 9:30am and 10:30am and suggested I go to a restaurant, eat something for breakfast and stay warm. I decided I had plenty of time to do that, so I did. After I ate and, although it was only 8am, I walked back to the lot and waited outside. I wasn't going to take any chances I might miss Terry! An hour later, my friend, Martha, who is a fellow fan and member of The Fuselage called me to tell me she was on her way. She also told me she had seen Terry walk past her the day before, but she didn't say hello to him! I couldn't believe it! I know I would have stopped him. When she finally arrived, I handed her a sign I had made to get Terry's attention. We each had one that read "DOLT hearts Terry!" DOLT stands for Disciples of Locke's Teachings and is a fan group for Locke/Terry fans on The Fuselage. Terry has been known to stop by and post there from time to time, so I knew he'd not only see that he had fans waiting for him, but they were from the Fuse. He's said many times how much he enjoys meeting his Fuse friends. Martha and I stood with our signs and I asked the guard a few times if Terry had arrived, yet. A few cars had pulled in with dark windows, so I wasn't sure if he had arrived and we weren't aware of it. The guard was very nice and let us know he was not there. Before Martha arrived, I had seen one car pull in and a I saw a lady in the front seat with dreadlocks. After the car drove in, I asked the guard if that was Whoopi Goldberg and he confirmed it was. Neat! Anyway, right at 10:04am, a car with dark windows pulled in and as soon as they had driven into the lot, the guard told us it was Terry! He said Terry had seen us, but we weren't sure if he was saying that because he had told the people in the car we were there or what. Ah, the things we'll do to meet someone! We were in the store about an hour and my fingers finally thawed out. Luckily, the manager of the store was also very kind and allowed me to use their restroom, as well! We had purchased some hot chocolate, after all! A little after 11am we finally went back across the street. The show had only just started, but since we didn't know the exact time Terry would be on and if he would leave directly after, we wanted to be sure and not miss him. We had decided we'd just look for every dark car and wave our signs in front of it, to make sure he saw us. Turned out we didn't have to. Around 11:50am I saw a car moving within the lot and then saw two people start walking out toward it. I didn't give it much thought, because they didn't get in the car and when I saw them walking toward us, I just thought they were a couple of employees who were leaving. When Terry was a little closer, I walked toward him and called out to him and introduced myself. He stepped close to me and gave me a hug and kiss. I had also told him I'd come in all the way from NH just to see him and that I'd waited a long time to meet him. He was just as sweet as can be. I then asked if I could get a picture and the woman who was with him took a couple for me. Next I asked Terry if I could get a couple of autographs. At that time, he pointed out there were some other people waiting. I think he just wanted us to be aware he had to give them some attention too. But I was surprised to hear there was someone else there. The entire time Martha and I were waiting we were the only two. But lo and behold I turned around and there were two guys with pictures to be signed! I said, "We've been standing here for hours." One of them said, "I know." I was thinking, where the heck did they come from?! I remember seeing a vehicle parked on the side of the road and realized they must have been waiting inside it! To think Martha and I waited in the cold all that time and they were in their nice car. What if we hadn't been there? I guess those guys would have had to wait in the cold, too! Anyway, Terry was very gracious and did give me my autographs. I had him autograph the variant cover of the LOST magazine for me and a copy of TV Week for Melissa, our webmistress. I took a few more pictures of him, while he did, and told him several times how nice it was to meet him and thanked him many times for coming out to see us. I told him it had made my year. He then gave me another kiss! Without thinking twice, I stepped forward and returned his kiss! 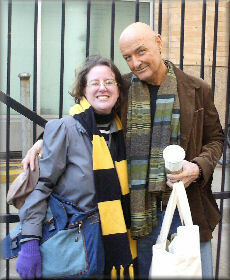 Yes, my lips touched Terry's O'Quinn's cheek! As Martha and I were walking down the street, I let out a big excited scream and was jumping up and down. Then I thought, OMG! What is Terry thinking if he heard that?? I then got on the phone with my husband and told him I met Terry! I was simply too excited. It was quite amusing, but I wouldn't change a moment of that day for anything in the world. I'd like to end this by thanking Terry again for being such a gracious friend to his fans! Go here to see larger versions of my pictures with Terry.